Everyone, including presenters, must register to attend the convention. 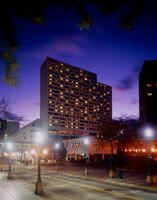 The 2009 International Sigma Tau Delta Convention will take place March 25-28 at the Hyatt Regency Minneapolis, in Minneapolis, Minnesota. Online registration will be available starting January 5, 2009 through March 13th provided that payment is made with a Visa or MasterCard. Any registrant, including Sigma Tau Delta student members, Sigma Kappa Delta members and guests may use the online registration system. The Early registration fee applies through February 25, 2009. After this date, participants must pay the late registration fee. After March 13, 2009 participants must register on-site at the convention desk. A processing fee of $2.00 will be added to each payment transaction. Your online registration account is not your Write Away! account. Online registration is part of a system called EBMS. In the future, your account will be used to access other Sigma Tau Delta online functions, that will be introduced over the next twelve months. If payment cannot be made with a credit card. Registrants must register by post mail. All participants, including guests, must fill out a separate registration form. Early registration forms and payment must be postmarked by February 25, 2009. After this date, participants must pay the $80.00 late registration fee. All mailed registration forms must be postmarked by March 13, 2009. After this date, participants must register on-site at the convention desk and pay the $80.00 late registration fee. A $2.00 processing fee will be added for each participant registered using a check payment. Register online between January 5 and February 25, 2009. After February 25, 2009, the late registration fee is $80 for all participants. After March 13, 2009, register on-site at the registration desk. The late registration fee of $80 will apply for all participants. Purchase your T-shirt when you register! Only a limited number of T-shirts will be for sale at the convention. Select size when filling out your registration form and include payment with your registration fee. Attendees should wear business or professional attire during the sessions and dressier attire for the Awards Banquet. Sigma Tau Delta makes every effort to accommodate those who have special needs relating to the Americans with Disabilities Act of 1990. Should you or anyone with you require special assistance, please submit a list of your requirements with your registration. Minneapolis photography is courtesy of Meet Minneapolis unless otherwise noted in the file name.